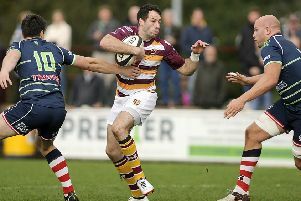 Fylde RFC responded to adversity in the best way possible last weekend and are well placed to battle for promotion in the final third of the National Two North season. That’s the view of head coach Warren Spragg after his side bounced back from the defeat at Sheffield Tigers, which ended their nine-game unbeaten run, with a 31-5 home victory over Tynedale in “disgusting” conditions at the Woodlands last weekend. Spragg received precisely the response he wanted and told The Gazette: “We were good across the pitch against a side in good form who had hammered (second-placed) Chester the previous week. “We got ourselves together and played some good, tough rugby in horrible conditions. 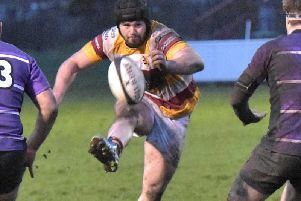 A pleasing day for the club became even better when leaders Hull Ionians’ second successive defeat (at Stourbridge) reduced their advantage over fourth-placed Fylde to five points with 10 games to play. Fylde visit bottom club Peterborough Lions tomorrow. After the leaders’ fifth defeat in 20 games, Spragg acknowledged that the eventual champions could now finish with a total below the 115 points he predicted last week with Hull on 73. However, he maintains there is still very little margin for error. The Fylde boss added: “I can’t see the team who wins the league losing more than two of the final 10 games, so we would probably have to win eight or nine from here. “Hull and Chester play each other a week on Saturday, then we play Hull the following week. “The top four teams still have to play each other, so we still have everything to play for. We know we are in an exciting position but we need to stay calm. But Fylde enter the game full of confidence and no-one more so than fly-half Greg Smith, who missed some vital kicks at Sheffield but landed all five goal attempts against Tynedale and scored a try to boot. And Spragg was delighted for his number 10. “When you have responsibilities like that you accept a lot of pressure,” he said. “That means you take the pats on the back when you kick the goals but feel the pressure if you miss a couple. “Greg is hard on himself when things don’t go well, so it’s important that we stick around him and make him know we trust him.